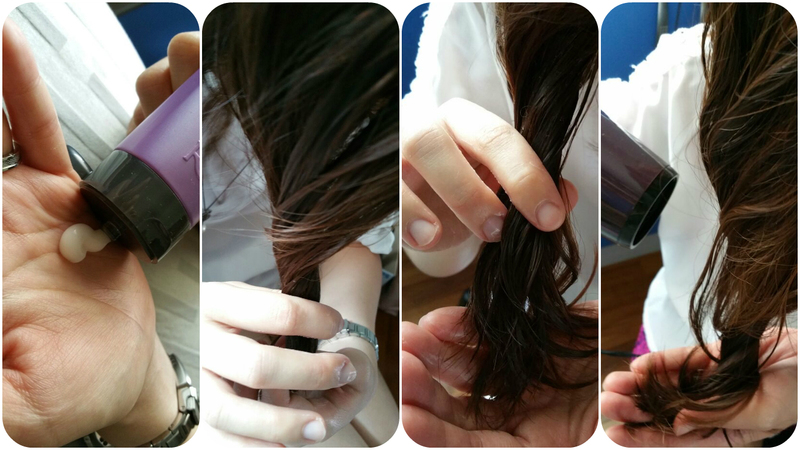 RICH Haircare Miracle Renew CC Collection! Hello everyone! Sorry for disappearing as i was away for a vacation in Lombok! 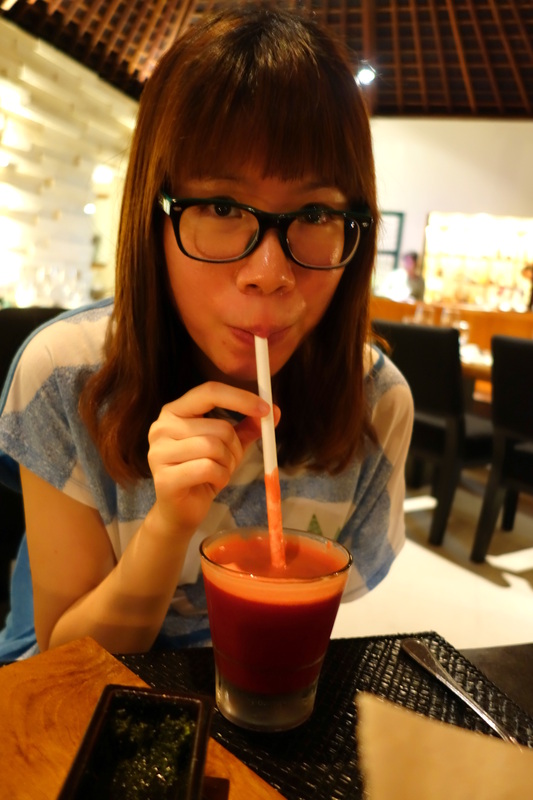 I have rested well during the 5 days trip and here i am to jump-start my blogging mojo. 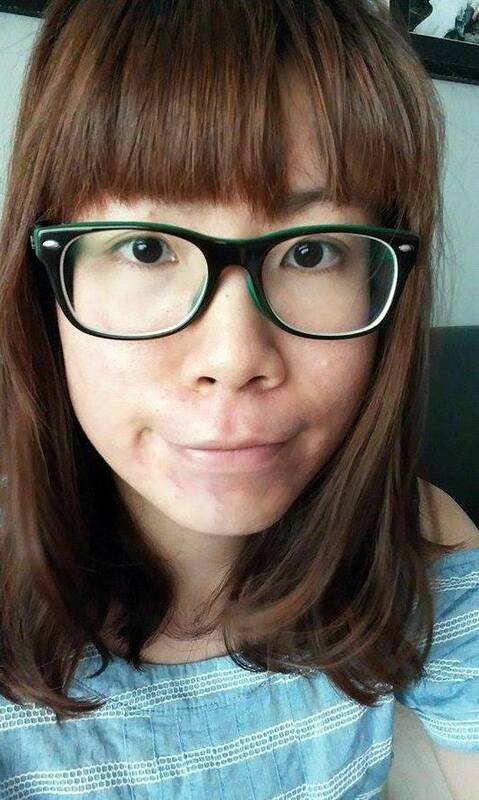 In May, i have gotten a hair makeover in Korea – Magic volume and C perm done (Completed with a treatment). Now, it has been 4 months since the makeover and my curls are still looking good!! To maintain the curls and the softness of my hair, i’m currently using two Multi-benefit products to hydrate, volumized and to strength it! The picture below is taken 24 hours after i washed and styled my hair (Within the 24 hours, i slept, went to work and took a plane to get to Lombok). My hair is still looking good, tame, soft and smooth with little flyaway hair! The two products are from RICH Haircare Miracle Renew CC Collection! As the name suggests, this multi-benefit range offers ‘Complete Care’ to restore hair’s natural beauty by fighting the signs of aging and plumping-up limp locks. The Miracle Renew CC collection would be perfect for ladies who are looking for multi-benefit products for youthful voluminous hair that is full of life and natural movement. As i have oily scalp yet dry hair ends, i will tend to look for shampoo that’s moisturizing yet not too rich for my scalp. 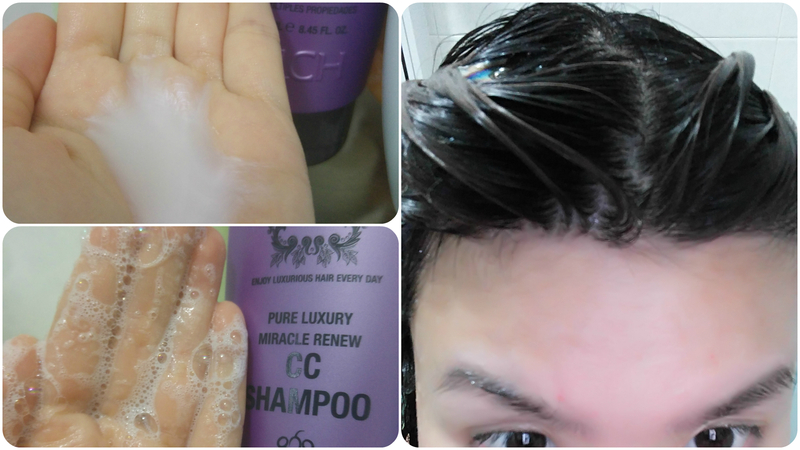 RICH Haircare Miracle Renew CC Shampoo is able to fulfill my needs. It keeps my hair beautiful and shiny from scalp. It remove impurities, refreshing the scalp by thoroughly cleansing the pores, supply and moisturize deep into hair. Infused with wine extract, the shampoo actively brighten hair colour and protect hair from future environmental damage. It also moisturise hair and cleanse the scalp thanks to an algae extract derived from seaweed that’s rich in proteins, vitamins and minerals. Hair will be strengthened, restored and repaired plus, the Shampoo helps accelerate the absorption of collagen to moisturise and enhance hair’s natural defences. It also contains a beautiful blend of argan oil and hydrolyzed wheat, soy and corn proteins to create soft, shiny hair that’s smooth and free of frizz. As mentioned, i have dry / damaged hair with an oily scalp and so the shampoo i use must be able to moisturize ends yet not too rich. 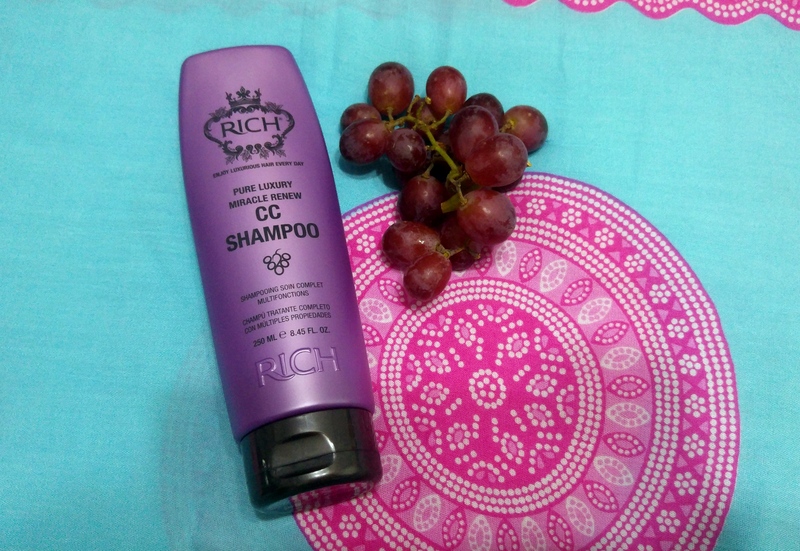 First of all, RICH Haircare Miracle Renew CC Shampoo smells really terrific! It has a really pleasant sweet grape scent! The scent is rather long-lasting as it leaves my hair smelling awesome all day long! My husband calls me ‘Grape Head’ after i washed my hair. Hahaha! It works into a moderate amount of foam to help remove built up and residue. Personally, i will prefer my shampoo to be more foamy but i can live with that as long as it cleanse well! I love how light my hair feels after washing and the shampoo does not will weigh my hair down. It leaves my scalp fresh and there’s no itchiness (My scalp will feel itchy if the shampoo i used is too rich) and my hair tangled free (i can run my fingers through it easily!) My hair isn’t so flat, has a nice sheen and it is soft and smooth to the touch! I’m not using a conditioner currently as i felt that my curls are not so obvious if i do! Despite using the shampoo on its own, the moisturizing effect is good still!! Did i mentioned that the shampoo is UV, heat & colour protective? It is great for someone like me who blows dry my hair everyday and i will certainly repurchase this shampoo in the future. 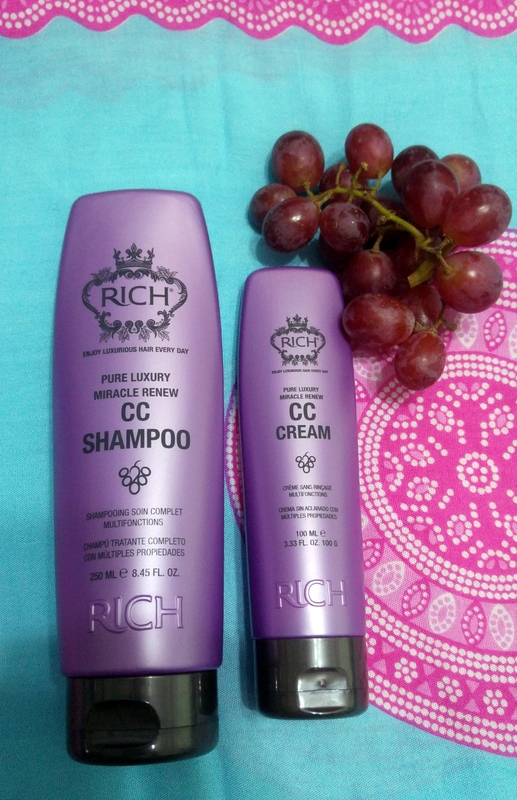 After washing my hair, i will blow dry it then apply the Rich Pure Luxury Miracle Renew CC Cream to set my curls and also to further pamper my hair! It helps to revive limp, dry and damaged hair to its former glory. Thanks to a brilliant Vitamin B complex, the Cream helps energise cells, promote protein metabolism and renew tissue as well as boosting volume where it’s needed most! An algae extract, derived from seaweed, is on hand to moisturise hair and scalp as well as nourishing them with amino acids, vitamins and minerals. Argan oil actively moisturises and conditions parched hair whilst a beautiful blend of hydrolysed wheat, soy and corn proteins help smooth, strengthen and tame frizz. As well as offering colour protection, the Complete Care Cream also protects against UV and heat damage. Simply comb the ultra-lightweight cream through towel-dried hair and blow-dry for gentle style definition. 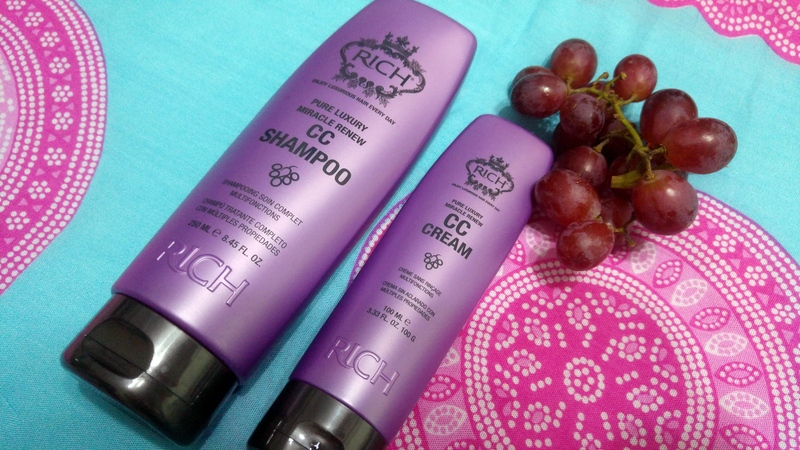 * Disclaimer: Products Description & Information are extracted from RICH Haircare’s Presskit.